Twenty years ago in October (exactly twenty days after I got my driver's license), I went to see one of my literary idols. 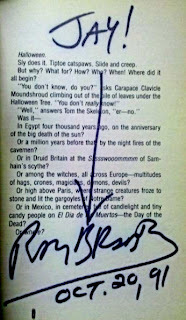 Ray Bradbury was beyond an author to me. He felt like more of a mystical travel agent. He was the first author to make me feel like I was within the story, and not just hearing about it. When I showed up at Earthling Books, I bought six of his novels to get signed. Most of them, I'd already checked out at the library and read, but now I was going to own autographed copies! 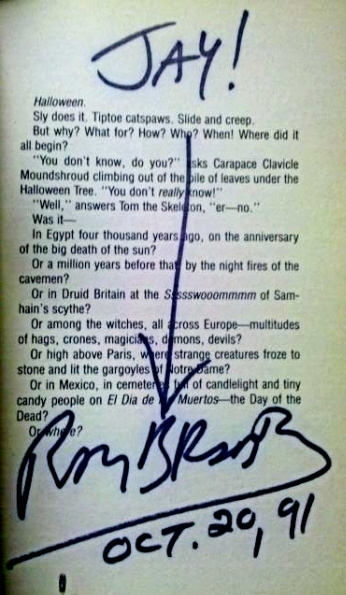 The one I was most excited to see Mr. Bradbury sign his name in, and the one I still need to pull off the shelf every October, was The Halloween Tree. The first several chapters in that novel are Halloween. Like most holidays, Halloween hasn't felt nearly as magical as an adult as it did when I was a child. But this year, I'm seeing the excitement and mystery through my son's eyes! Isaiah's Uncle Nate & Aunt Sarah came over on Halloween Eve to carve pumpkins. Isaiah chose his pumpkin, JoanMarie drew a face on it to resemble his smile, then Isaiah helped clean it out. 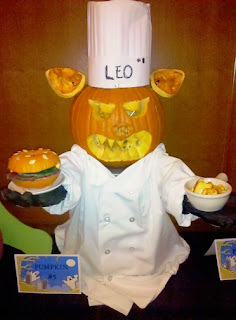 I did the cutting, added the candle, then we lined up the jack-o-lanterns on our porch. Congratulations to Jennie Englund for being randomly selected to win the tenth round of Future Friday giveaways! To claim your goodies, send your mailing address to EmmaNelson4Ever@aol.com. If you don't know who Emma Nelson is, you will when you start reading The Future of Us! Jennie's favorite Halloween costume was that of a co-op shopper. "I bought knitted, cut-off rainbow gloves and a beanie from our co-op, and I carried around a hemp shopping bag with carrots in it." While I love my local co-op, I hope no one gave you co-op candy while you were trick-or-treating, Jennie. 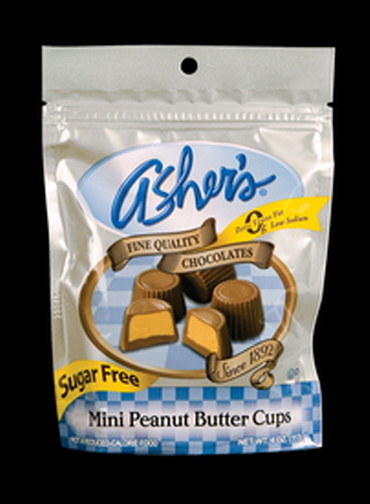 Halloween candy is supposed to be full of sugar and artificial yumminess. 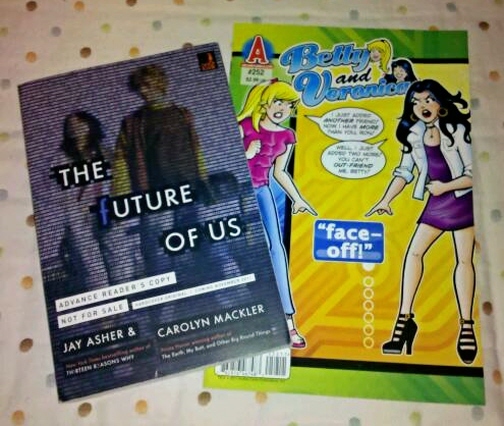 See ya next Friday for another chance to win an Advanced Reader's Copy of The Future of Us! For our tenth giveaway, the bonus item is Betty and Veronica #252 ("face-off!"). Yes, Future Friday #5 also featured an Archie Comics Facebook-themed giveaway. When we wrote a few lines about Archie Comics into The Future of Us, we had no idea their writers were about to weave Facebook into the Riverdale High storylines. 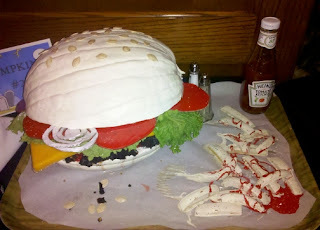 This week, we wanted to do something with a Halloween theme. 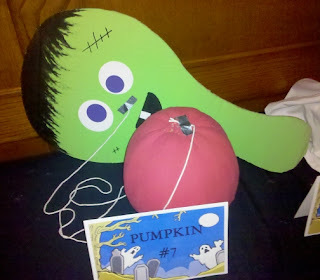 While we couldn't think of a book-related Halloween question, we both realized...we don't care! So tell us, what was your favorite Halloween costume that you wore trick-or-treating? 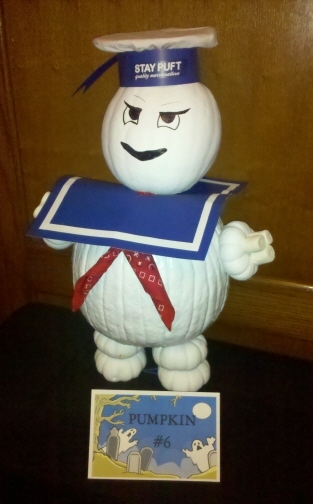 My mom used to make our Halloween costumes, or we did it with her. One year - and this is bizarre because Jay's favorite costume also involved facial hair - I was an old man. Yep. I was in fifth grade then. I dressed in worn out dungarees, a faded plain shirt, and I put on a long gray beard. I even walked with a cane, all stooped over. I won a prize in the kiddie parade that year! And you're wondering why I wasn't popular? This was the Halloween after the movie Teen Wolf came out. I bought patches of fake fur and easy-to-remove costume glue, then attached the fur to my face, arms, and legs. I looked so good! But the glue did not come off easily. I went to sleep with most of the fur still on, then woke up for more painful peeling. Just like in Teen Wolf, I played basketball, and I had a game the day after Halloween. So I kept my socks pulled up real high because most of the ankle-fur remained. 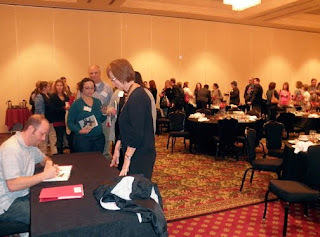 On Thursday, I arrived in Wichita for the Kansas Association of Teachers of English (KATE) conference. While saying "Kansas Association of Teachers of English" may sound awkard, I'll assume it's grammatically correct. When John and Bryan picked me up (they're both English teachers...I mean, teachers of English), they took me straight to the Cosmosphere. All three of us are space nerds, and when they found this out about me, they made sure to include this in my visit. And it was, for lack of a better English word, awesome! First of all, the museum has a moon rock. This little lunar nugget was protected by several sensors and flashing lights, so I even felt a bit nervous getting this close to photograph it. Something I had never heard about, or just don't remember being taught in American History, are USSR pennants that reached the moon a decade before we stepped on it. When one of these hit the moon, it scattered the tiny metal plates all over the surface. Maybe you've heard of something called Apollo XIII. But have you ever wondered where you could see the Command Module Odyssey for yourself? Well, it's in Kansas, of course! And now, here's a picture of the Spacenutz. But I wasn't here for Kansas'/Kansas's (whatever!) spacepumpkin goodness. I was here for the conference, which involved meeting the 2011 Newbery Medal winner, Clare Vanderpool, a native Kansan, Kansian...person from Kansas. (These people who teach English make me nervous.) And I got my copy of Moon Over Manifest signed! Well, I'm heading downstairs for KATE's Centennial Celebration Reception, and then a few teachers promised to take me out for some great local ice cream. Oh, but guess what else I saw in Kansas. An actual NASA disposable absorption containment trunk. But I like to call them astroboxers! The Texas Book Festival was a great way to end my weeklong tour. Even though I've been averaging 4.5 hours of sleep per night since last Sunday, being surrounded by both readers and other authors gave me plenty of energy to sprint through the day. On the stage of a church, I was a part of panel titled To Ban or Not to Ban: What Is the Question? Here I am with moderator Judith Platt, and co-panelists David Levithan, Ellen Hopkins, and Jessica Lee Anderson. We each wore those pink microphones that clip around the ear, run down the cheek, and point to the mouth. For a couple questions, Ellen's microphone didn't work, so I leaned my head next to hers so everyone could hear her. We share an agent, so watching each other's back is much more important than personal space! Then Ellen and I hopped onto the back of a golfcart (always wanted to do that!) and headed to the hotel where a lot of authors were staying. There, we bumped into Sarah Dessen. Do you see why I love literature festivals? In the evening, teen authors at the conference came together at the beautiful Texas State Cemetery for an event called A Convergence of Souls. It was there that I finally met James Dashner. When Carolyn Mackler and I recorded our videos in Seattle (was that really just last Monday? ), Mr. Dashner recorded right after us. Unfortunately, we couldn't stay until he was done. But our paths crossed in a different state only five days later. Crazy! While I have waited in line to get a couple of books autographed by Louis Sachar, it would've brought up a lot of questions to know that the first time I actually got to talk to him, we'd be standing in a dimly lit cemeterey. A whole bunch of teens and parents listened to the authors play a couple rounds of story-building, where we were given a genre and the first sentence, then we each went to the microphone and added a sentence. The stories we came up with will never be published, which is a very good thing! A librarian also played a round of Mad Libs using audience suggestions, and another librarian read a story she wrote using titles of books from every author there. Then I went to one final afterhours bash with several people from Penguin and Joe Schreiber. In the morning, after another 4.5 hour sleep, I'm finally heading home. For the past two days, I've been running around Colorado. It's my first time in this state, other than a quick layover, and it's absolutely beautiful. Next time, I hope to get more time to stare at those mountains (several hours a day would be nice). My first stop was Fossil Ridge High School in Fort Collins, which was a very impressive campus to explore. That night, I spoke at Council Tree Library, with Old Firehouse Books selling the books. 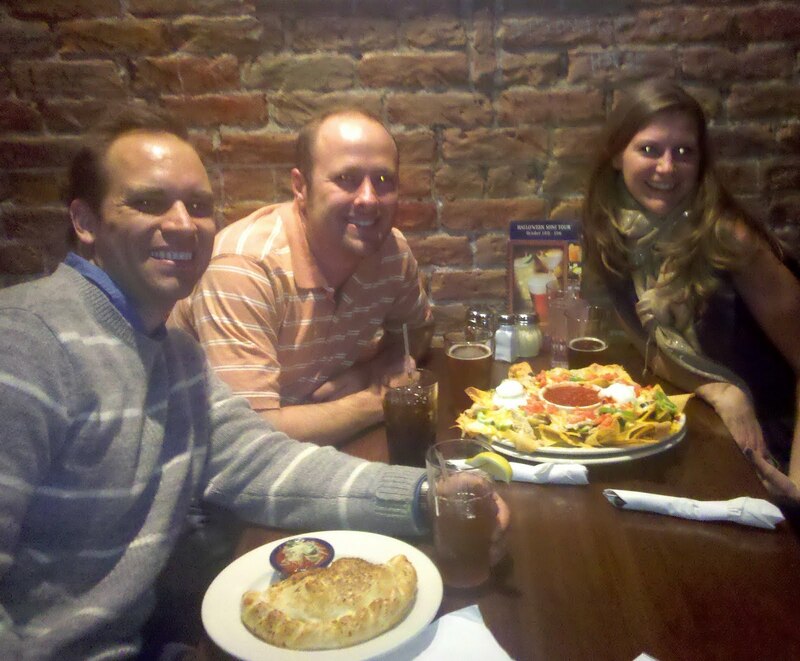 After my presentation, I headed to Old Chicago with my longtime pals, Eric and Anna. Knowing people around the country means I get taken to the yummiest spots where the locals eat. 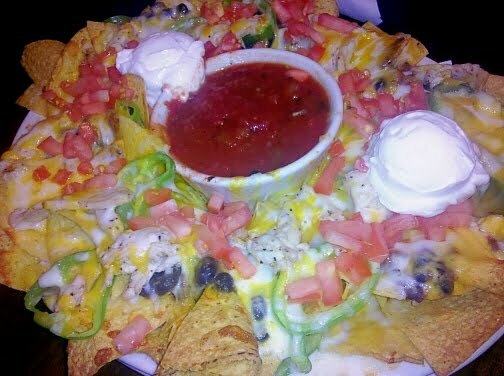 Check out these nachos! ...and Mountain View High School. I rounded out my trip to Colorado with a signing at Barnes & Noble in Boulder. Upcoming YA author (and sister-in-agency), Emily Hainsworth is seated on the far right. Today, I'll be in Austin for the Texas Book Festival, which is the last stop on my book tour. It looks like it should be a very fun day. And then, I'm heading home! 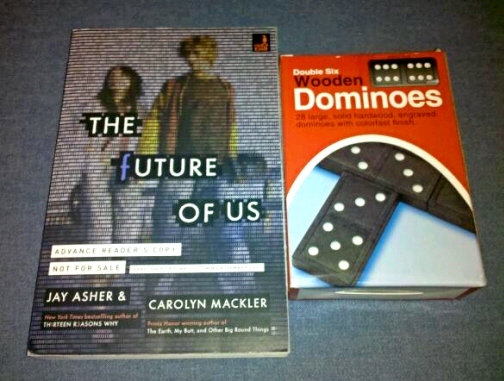 Congratulations to YA Reader for being randomly selected to win the ninth round of Future Friday giveaways! To claim your goodies, send your mailing address to EmmaNelson4Ever@aol.com. If you don't know who Emma Nelson is, you will when you start reading The Future of Us! If she could experience any week in history, she would go all the way back...to Thursday. That way, she could let her St. Louis Cardinals know that the 9th inning is going to be rough. For our ninth giveaway, the bonus item is a box of 28 wooden dominoes. Metaphorically, our book is very much domino-related. One character even mentions The Domino Theory while sitting in a pizza restaurant (but not Domino's Pizza, cuz that'd be taking the domino-thing too far). Do you remember the last time you set up a line of dominoes and then watched them all fall? Don't you think it's about time to do it again? This week, we want to take you time traveling. In our book, over one week, Josh and Emma glimpse their lives fifteen years in the future. But we want to know, rather than glimpse your future (which you've already told us about), if you could physically spend one week at any time in history, when and where would it be? In the mid-80s, a lot of bands I later worshiped in high school were relatively unknown, playing small clubs in L.A. I'd love to find one week packed with their shows and live out my teen fantasy of seeing them before they got big. But I'd feel so cheesy wasting a time travel opportunity on that. Instead, I'd travel to Philadelphia, beginning on July 2, 1776, and finishing on July 8 when the Declaration of Independence was first read aloud to the public, with bells ringing across the city all day. I would say it's a toss up between a week with Laura Ingalls and her family on the prairie, the summer of 1969 (during the moon landing or Woodstock), and a week of myself in junior high. I would pull myself aside and tell myself who to ignore, what to actually care about, and - for the love of god - scrounge together your allowance and buy real estate in Manhattan! 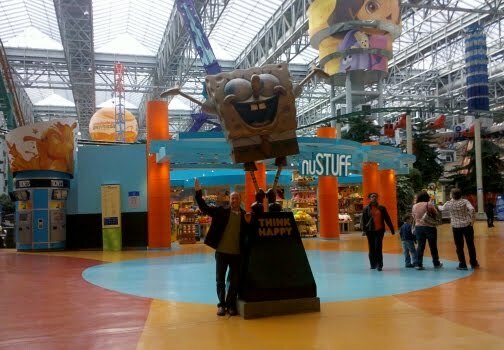 For example, the Mall of America. That place is huge! If you've never heard of it, check out these facts. Yes, they have an amusement park in the mall. The highlight for me was a place I've been reading about since I was a kid. Charles Schulz, the creator of Peanuts, used to live in an apartment above his dad's barbershop. There's a bar there now, but I've wanted to visit this spot for years...and I finally got the chance! My inner-child did The Snoopy Dance as I toasted the comics on the wall with a glass of Snoopy's favorite drink. Root beer! So far on this tour, the Minnetonka public library brought out the biggest crowd, which always translates into more energy (making it harder to fall asleep when I get back to the hotel). And a big thanks to Wild Rumpus for handling the book sales. Well, now it's finally time to force myself to get some sleep. Tomorrow is my stop in Fort Collins, where I'm hoping to have dinner with one of my favorite people (who just happens to be an author). I've never had this much fun on so little sleep. Last night, I took a red-eye flight from Seattle (11:40pm) to Cincinnati (8:50am) with a brief layover in Chicago. With the three hour time difference, that meant I began the very full day with very little sleep. But the adrenaline kept me movin'! ...and then a class of seniors. ...I attended a pizza party with members of their reading group. It's not a book club where everyone reads the same book, but everyone talks about their favorite latest reads. And I came away with a few great titles to check out. Based on consistent recommendations by my Facebook friends, I grabbed a second bite to eat at Skyline Cafe. Chili-covered spaghetti is so yummy! While my hotel didn't have signed books by authors who've stayed there (like the past two) or funky robes (like the last one), it did have Tent City from the local Occupy Movement (Occupy Cincy) right outside. Then it was back to the library for the main event. Joseph-Beth Booksellers handled the book sales, and here I am with Annette from JBB. Once again, I had a great time speaking to and speaking with everyone who showed up. And now it's off to bed, because I have to get up a little before 5am.